Have you been the victim of a VPN scam? With the growing interest in online privacy and security, there are new VPN services popping up every week, promising 100% online anonymity and a “secure and private” browsing experience. And of course, you’ll find plenty of fake reviews on various “best VPN” websites to tell you they’re legit. Unfortunately, I’ve found that many VPNs are misleading people with false marketing claims, sales gimmicks, and various scams. And because VPNs are often located in overseas jurisdictions, they will probably never be held accountable for dishonest marketing and/or outright fraud. 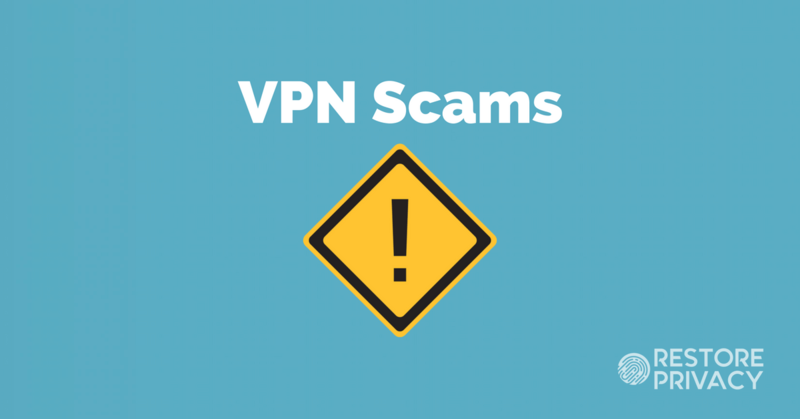 Since most people don’t know what to watch out for, many fall victim to these common VPN scams. But you’re smarter than that. Running a fast, safe, secure network of worldwide VPN servers with good apps and support is expensive with fixed recurring costs. Given these high costs, how can so many VPNs be offering cheap “lifetime subscriptions”? The “free” or cheap VPN is collecting user data and selling it to third parties and advertisers (a popular and lucrative business). The VPN blasts you with ads or redirects your browser to third party websites – and then earns commissions on sales. The “lifetime” claim is a lie and they will simply cancel your “lifetime” subscription after a year or two (see VPNLand example below). The VPN is similar to a Ponzi-scheme, requiring an ever-increasing number of new subscribers to remain financially solvent, until the house of cards collapses. Bottom line: The “lifetime” is actually referring to the lifetime of the VPN company – not the customer. After selling a large amount of lifetime subscriptions, the owners could simply pay themselves out and then close the business. Just fyi. A “lifetime” account does not mean it will be valid till someone dies. It could be anyones lifespan – such as a cat, or lifespan of a hardware. Don’t fall for the lifetime VPN scam. Why are there so many free VPNs? Answer: Free VPN services are being used as a tool to collect your data and resell it to third parties. Most people focus on the word “free” instead of seeing the big picture. Just like with Gmail, Facebook, and other free products, free VPNs are are just another way for companies to profit off your data. 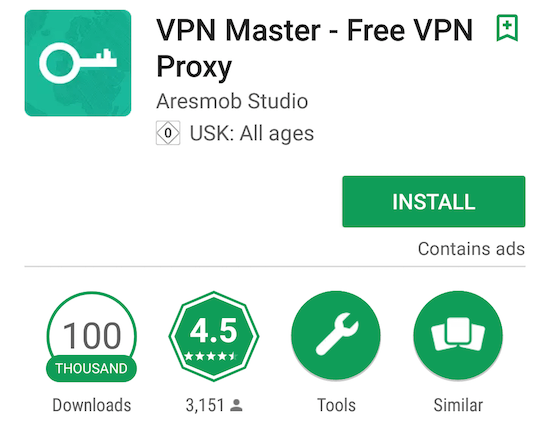 Example: This free VPN app is called “VPN Master – Free VPN Proxy” and is officially listed in the Google Play store. Notice that it has a high rating (4.5) and approximately 100,000 downloads. 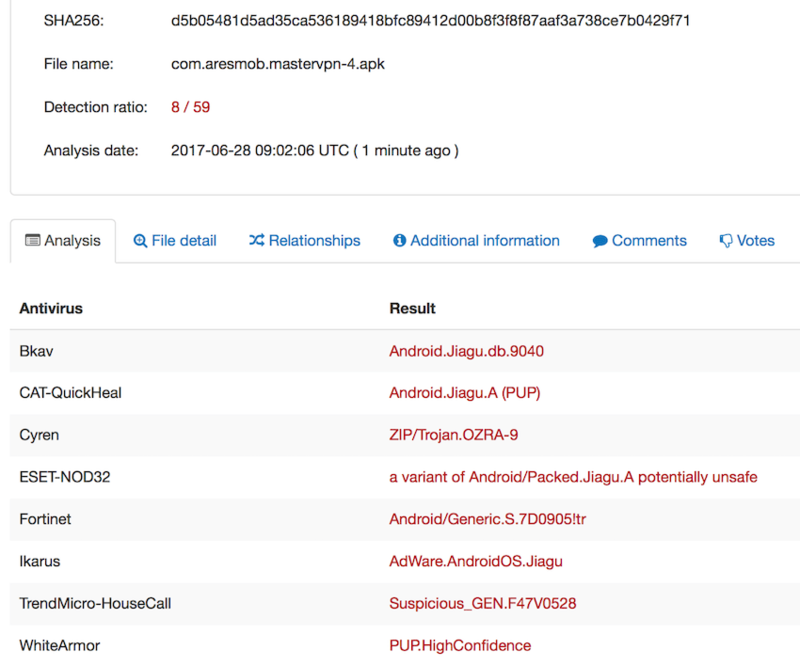 However, the “VPN Master – Free VPN Proxy” app also had eight positive hits for malware. This free VPN also comes with lots of free malware. Extra Note: This is why you should never trust ratings in the Google Play and Apple stores. When you look closely at the growing VPN app scam, the scariest thing is that many of the most malware-infested apps are highly rated. This means there are literally millions of people using VPNs that contain malware and tracking. This is especially the case for free VPN apps – see the review for Betternet or VPN Master. With the growing interest in VPNs, fake VPNs are also coming onto the market. In other words, there is no VPN service at all – the scammers sell “VPN subscriptions”, and then take your money and run. One recent example of this was MySafeVPN – but there are other examples as well. In general, it’s smart to avoid all the new VPNs flooding onto the market, promising to make you “anonymous” with their software. If the VPN service does not have a history and track record of good performance and support, it should probably be avoided. “Fastest” VPN – Many VPN services claim to be the “world’s fastest VPN.” Of course this is just marketing, with many VPNs having very mediocre speeds (usually because their servers are overloaded with users). Be “Anonymous” Online – The reality is that you can never be 100% anonymous online. A VPN service could still see what you are doing if they wanted to, because you’re using their server network. Furthermore, it’s very difficult to be “100% anonymous” with anything, simply due to all the developments in tracking. But if you want to get as close to anonymous as possible, use a multi-hop VPN chain, along with other best privacy practices. IP address “leak protection” features – Lots of VPNs promote various leak protection features that don’t actually work. The only way to verify the features is to run the VPN through a variety of VPN tests. Here is one example from my review of PureVPN. Notice all of the leak protection settings are enabled with the VPN application (right), yet there are extensive data leaks in the test results (left). Here we have a clear example of features that do not work. This is another reason to test your VPN. Have your scam radar on high alert when reading the claims and features on various VPN websites. Every week there are new VPN services being offered and dozens of fake reviews to tell you they are amazing. Although I can’t prove it, I suspect many of the VPN “review” websites are owned and operated by a few of the large VPN providers. They have the money to pay for good reviews, comments, testimonials, and all sorts of other shill activity. Keep in mind, many VPN “reviews” aren’t based on actual testing. These reviews aren’t reviews at all, but instead just paid marketing services. Why trust your private information and banking details to third party sales websites? Why is the VPN service even partnering with third party websites to offer “sales” or “lifetime subscriptions”? It’s best to avoid middle men and third party websites – buy your subscription directly from the VPN company itself. I have also seen examples of VPNs cancelling all lifetime subscriptions that were purchased through third parties (see VPN Land above). When the user complains, neither the VPN company nor the third party sales website take any responsibility. My recommendation: only deal with your VPN directly, no third parties. At the end of the day, a high-quality VPN service will not be free and will not resort to various gimmicks to boost their sales numbers. They will also be transparent and should have a strong track record of providing people with a good service. There is additional information about known issues and problematic VPN services in the VPN Warning List. If you are done reading about scams and want to see some high-quality VPNs that have passed all the privacy and security tests (and are located in good privacy jurisdictions), check out the best VPN report. Last updated on March 19, 2019. This article misses scam #8, which is VPNS selling crypto. A handful of players are starting to offer this, although I have yet to find one w an actual coin that is created and on an actual market. Most just offer a ‘voucher’ for coins down the road, but the plans to justify, support and develop such a coin is lacking. As an examle, check out yin.bi.com – brought to you by Lantern VPN, which used to be my go to service, but I’ve noticed a real drop in service latey. Maybe it’s the reprioritization of coins over sevice…who knows, but if you ask me, its a scam. Vy informative article. I have some questions about FastestVPN. FastestVPN doesn’t seem to be leaking per ipleak.net; they claim to be based in the Caymans (thus not 14 eyes); their website indicates a no-log policy. However, cpu usage is running about 25-30% and the internet kill switch requires manual reconnect . My questions: Is this CPU usage normal? Is the manual reconnect after internet kill switch operation normal? Do you have any info regarding the veracity of their logging policy? Hi Jerry, I haven’t tested FastestVPN yet, it is a relatively new provider, but I may have time to review it in the coming months. I received a message on my Apple phone, XR, that said my phone was compromised with 6 virus’s and to go to the iOSVPN code.com website to remove the viruses. I did not as I thought this was a scam? Of course… a website doesn’t have a way to scan your phone for viruses when you just have accessed it. Beware of ProtonVPN , they are opening ports and then denying it yet it’s easily detected on Shodan, ShieldsUp and many other test sites. UDP connections are opening port 443, 8080 and recently they started opening port 21 (FTP). Port 443 is acceptable but 8080 on UDP is not. The connection is not a true VPN tunnel it’s just a cached proxy. As for port 21, there is no acceptable reason to have them opening a file sharing port unless they are up to no good. Check it out for yourself and save your money while protecting the integrity of your data. What do you know about Strong VPN? Is this a good one? Hi Jill, I’ve been meaning to review it. I’ve heard it is a decent VPN, but it’s based in the US (Five Eyes). I have been trying to reach their support to dispute an unauthorised charge, and they aren’t responding to website or phone. My experience has been horrible, and I recommend not using them. If you didn’t pay for it, you probably don’t want it on your computer collecting data. Is Luna a good VPN? Oh, Sven, I used a VeePN, I need it for a work, and I never have a problem with it, does that means it’s a good VPN? If it is a free VPN, I would say no. Is innetvpn a safe choice? How do you get rid of a VPN ? Well, normally you just uninstall the app. what do you think about nord vpn? NordVPN is definitely a solid option when I tested it for the NordVPN review. Yes, it did well in testing for the VyprVPN review. This is because I am a reseller. Some people want to share their subscription costs with someone to pay less money. Do You think this is a scam?????? You should only buy a VPN subscription directly from the VPN service. Who knows, this guy may be selling the same subscription to multiple different people. Most VPNs also prohibit any sharing or reselling of accounts. If you need support, that may be an issue. Is nordvpn safe? been using it for a while, seems great, very fast and secure. For example: NORDVPN Premium Lifetime for only 10$ ?! The invisible third party which collect your data is a big problem. True. But if any VPN service is not free, it is still can collect and sell your data. Yep, this is true. Choose carefully. Anybody had any experience with Fastestvpn? Looks odd – offering massive discounts and refers you to Google Play Store to download a free app but then requires payment to use, I foolishly took a three year discounted deal ($49.95) and am trying to get Paypal to refund. I found out today that PureVPN and IvacyVPN are, for all intents and purposes, the same service. However, PureVPN has the better selection of server locations made available to the end-user, as well as other account services details being modified. IvacyVPN uses your email at account signup as the username. Both PureVPN and IvacyVPN pull from the same list of IP addresses owned by Secure Internet LLC or GZ Systems. The IP addresses pulled from either of these two companies are leased to PureVPN and IvacyVPN. Neither of these companies maintains servers, they’re just a transmitting utility basically, like buying a third-party electrical supplier when it all comes from the same Electric Company. If you happen to have both IvacyVPN and PureVPN services, you can do some experimenting and find some interesting results. Hi Dan, thanks for sharing your findings. Hello, I have not yet tested it. What is the best vpn and what difference will I see using a vpn on my kodi on my nvidia? Hi Sam, check out the VPN for Kodi guide – ExpressVPN is one of the best options in this situation with Nvidia. You should not notice much of a performance tradeoff if you’re using a good VPN that gives you plenty of bandwidth. There’s an installation video explaining how to setup ExpressVPN with Nvidia in the Kodi VPN guide too. Thanks for the information. What are your thoughts about Avast’s SecureLine VPN? Hi, I have not tested it, but will hopefully get to a review in the coming months. Thanks, I’ll keep it in mind for a future review. I purchased Windscribe a month ago, and just recently started utilizing them. So far, the only part of their service I am using is the SOCKS5 setup for uTorrent. My main router uses OpenVPN through one service, and the computer I have setup for Torrenting has an L2TP windows config setup for a different service. Two VPNs and a Socks5 setup through Windscribe. Windscribe is one of the few VPNs that I’ve seen that expressly allows for torrent use. Others, not so much. So, I’ve got a tunnel within a tunnel, and a SOCKS5 torrent setup. So far, I can say that I’m pleased with the way things are working. Torrent speeds aren’t very fast, but… they don’t need to be. Windscribe is, what I would consider, strict about what protocols they use. Sure, security is a concern for everyone. PPTP and L2TP aren’t offered because of weaker security. Oh well. The only thing they offer outside of these commonly integrated methods is OpenVPN and IKEv2 protocol (Windows 10). I have not used their proprietary app on my desktop computers yet, though I am leery due to the fact some have reported excessive CPU use. Support for Windscribe has suggested that this is not true for “paid” users, and has said no mining occurs unless you’re on the designated page where coin mining happens. For what it’s worth, Windscribe does seem rather “defined” in what protocols are available, but I find it quite nice to have SOCKS5 options directly inside a torrent program. More tests will have to be done to confirm the SOCKS5 is actually working (but would uTorrent work if the information entered into the program wasn’t verified?). Also, will have to try OpenVPN from a Windows client and DD-WRT. I tried windscribe for a trial period. I opted not to purchase because I was not satisfied with this performance and limited data. Upon uninstalling it I discovered it left me a virus that gave me an invalid IP address and turned my domain from private to public. Would not allow me to interface with my own network or Internet. I was forced to do a complete restore and reimage to get back into my own Network. So, I got an VPN Unlimited 10-device plan, but they only allow one DD-WRT router setup (OpenVPN) per account. VPN Unlimited comes from KeepSolid. Avoid KeepSolid if you like OpenVPN or setting up VPN in DD-WRT. This just developed from KeepSolid’s VPN Unlimited after some push back on their restrictive practices. We are very glad to inform you about the latest update, that provides a perfect solution to your issue below. You could use that for your second router. However, the total number of connection sessions corresponds with an account’s number of slots (for you, the number of devices is 10). If you need any assistance, please let us know. I prefer to have my devices behind a router. I have not yet seen these new additions in my profile management page. can you tell me if DigibitVPN (Windows) is any good? Sorry Paul, I’m not sure about Digibit VPN, I haven’t tested it out. Hitman Pro detected malware in my Digibit app for Windows and quarantined it! Good to know, thanks Ian. I mentioned it on Digibit UK fb page and this was their reply. Hi Ian, well, it is true that antivirus software does not play well with VPNs. That being said, I usually run VPN software through a VirusTotal scan to see what comes up. There’s a chance for false positives, but if 3 or more antivirus tests are flagging the VPN, that may be cause for concern. 14 out of 65 have flagged it on virustotal, doesn’t look good. Are you planning on testing Digibit Vpn? I think I might have to stop using them. At least I only pay them monthly (£2). Hi Ian, wow, that is very concerning! In this study they said anything over four positive results should be considered malicious. Based on your test results, I would immediately remove the software and then run some antivirus scans. I may eventually test the VPN – but my focus is on the larger providers for the near future. Good luck. 1) DNS & IPv6 leaks in Windows 10 – this is down to how Windows 10 sends out DNS requests (in parallel to all network adapters) which means DNS (and IPv6 IP) leak and all Windows 10 installs have this problem, the fix here is to simply disable ipv6 and use the free OpenVPN client instead of the Digibit app as the OVPN client has Windows 10 DNS firewall built in which blocks all DNS requests except through the VPN (although you have to enable it in each server config file by adding “–block-outside-dns”). Once you do this you have a solid VPN as tested on the IP-leak – nothing gets out, if you didn’t want to use OpenVPN client then simply change your DNS server to Comodo or OpenDNS as this will not notify your ISP of your activity. 2) Support is good but can take a while to reply (a few days is the norm), but I like to think that’s because its cheap and therefore the savings are passed to us. They are very technical and certainly know what they are talking about. 3) Speeds are pretty good, I have a 37.5Mbps connection and like to use non EYE14 country’s servers (Poland & Switzerland are my two go-to servers) and both max out my connection to 33-35Mbps which is correct after 256-Bit AES Encryption (256-bit key) and 8.5Mbps upload from 9Mbps (latency = 40ms where its 15ms without VPN) so as you can see the connections are great. 4) Kodi & Torrents work perfectly with it, IPleak website tested for leaks and nothing at all was leaked, not even through torrents as ipleak has a torrent you can download to test it with and Digibit passes all tests with OpenVPN & its DNS blocking and IPv6 disabled in your network adapter. 1) The Android app keeps crashing, but this is only the front end and doesnt happen all the time, once setup the service is still active as you can see it running in the background. 2) No Server Side Certificate Verification – I’m not sure if this is a major issue, just OpenVPN red highlight’s it in the log, the link reports that without this verification your open to Man-In-The-Middle attacks, but to do this the MITM attacker has to emulate the server your connecting to, the VPN does use a login but I suppose a MITM attacker could just falsify the login handshake to make it look like a proper connection to the VPN servers. 3) No Kill-Switch or Connect at Startup options on either the Digibit app or OpenVPN, these would be handy as if the client ever drops the connection then it would block your normal connection to prevent you accidentally jumping on a non-VPN connection. Now given the minor moot points and the fact the service is only £2 a month (when paid monthly) and is aimed primarily at streaming services like KODI etc. I think its an extremely good deal, other services such as IPV and PIA are 4-5 times this and have similar problems with buggy software and also they suffer a lot of congestion due to their popularity. Hi Paul, agreed, there is a chance for false positives when using VirusTotal, but I personally would not be using anything that gets six positive hits for malware. That seems worrisome. But thanks for the info. Hi Sven, any thoughts or comments on the unblockr vpn ? Hi, I have not tested or researched that service. The reason a third-party vendor would be beneficial is because there’s no direct link between the person buying from the vendor and the VPN service itself. Also, you can certainly gift to your friend or family member by buying from the vendor. All they would need is the redemption instructions and link. As a computer tech with a small handful of clients, I purchase these lifetime subscriptions and pass the cost on to my clients if they want to use a VPN service. I utilize the services myself, and effectively get them at no additional cost. At most, they use one device or two and I use at most one or two devices also. Been using windscribe (free) for the last two months. 10GB/mo data usage. To good to be true? Well, the vpn seems to be working good, ip is actually changed. Speeds are good, and the 10 GB seems legit (compared to what my mobile data usage app says). Then last week I found something disturbing. Windscribes cpu usage was a constant 50% (with or without being connected to the vpn service). Same when absolutely no other program was opened and having internet access or using windscribe for that matter. Only by quitting the windscribe program did the cpu usage stop. I then found that there is a service available for gaining more data usage (up to 50GB/mo). When opening a special webpage windscribe uses your cpu at (magically) precise 50%, to mine for monero. They say it is only when that page is opened, but my conclusion is (without proof) that windscribe’s mining all the time….. Before I noticed the high cpu usage I didn’t even know about this mining business/internet. So is this scam #8…? I have the free 50GB Windscribe plan (a frequent special offer). With Windscribe on but not connected, there is no disk or network activity and the cpu activity is mostly 0%, periodically bouncing to 0.1% (according to Win10 Task Manager). Thanks Sven for this article, I was about to buy lifetime subscription of purevpn from third party site. So before buying, I started doing some research and found out your article, and then I was having a live chat with the purevpn guy asking him how many years does lifetime subscription last? He said 5 years!! What a scam! When did the word “lifetime” start meaning 5 years?! Are there any legit vpn services on which one could trust on? Glad to help! Well, I’d just say do your research and watch out for red flags. This problem, protect and speed up your connection. Installing will take about seconds. This message has locked my screen , and I am locked out of Safari on iPhone. I am sending this message from a separate iPad. I can access Apple Store. Hi Don, well I definitely would not download anything. Many apps in the Google or Apple Store contain malware. I’d contact Apple on that one, clearly sounds malicious. Hi Loren, In the PIA review I found some IP leaks and their support to be pretty poor, but other than that, not too bad. Are you referring to something specific? Stay away, scam company VPNLand. They can give any lifetime offer, and then after 1 year they cancel your account and tell you read their policy that they can cancel any account with any reason. So, big scam, they give lifetime account for cheap price, many orders, then after 1 year, they cancel them all. Their Connection is slow anyway. Bad support customer. Hi Ken. Thanks for sharing your experience. It sounds like this may be a standard practice with some of these “lifetime VPN” scams. That is a good idea. Using more than one VPN will further protect you. Hi Sven, thank you very much for your views. I’m using VPNSecure on Windows only. Its Android app doesn’t appear mature yet. Till now, I found the VPN service on Windows good and Support has always been very responsive. It’s a paid service for computers and I have a discounted lifetime subscription which will renew every 20 years according to support. Very informative article! Is SecureVPN a good VPN according to you? Been using this VPN over a couple of months with no issues. There are no ip and DNS leaks. Thank you. Hi Richard, I haven’t tested it, but I’d be careful because SecureVPN appears to be a free VPN in the Google Play and Apple stores. Usually free VPNs make money either through ads or by collecting and selling user data – you can see this free VPN article for more info. It may work fine, but still be collecting your data. I even found one free VPN that is owned and operated by a Chinese data collection company (giant scam!) see VPN Master app. Is ExpressVPN considered as VPN scam? Updated reply: No, ExpressVPN is not a scam – they have made some major improvements over the past year. Regarding logs, they are one of the few VPNs to have their “no logs” claims publicly verified with a real-world test case. See the no logs VPN guide fore more information. PureVPN are basically scammers based in China. They give you IP address that have already been banned on many websites and when I asked for the advertised refund, they said that I exceeded the data and connection limit by including some numbers in an email that could have been (and most likely were) made up by them, since there is no way for me to verify the numbers on their website. Their software is buggy and there is no way to telephone them. They are total scammers. Stay far away from these guys. 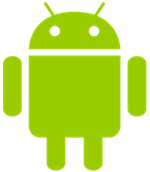 Hi Jackson, I basically came to that same conclusion too – see the PureVPN review. PureVPN owner is from Pakistan and all their staff is from Pakistan as well. Moreover, their claims about having servers in exotic countries is 100% lie. Basically, they have couple racks in a UK datacenter with thousands of IPs, and since they own these IPs they can cheat RIPE databases and assign any location to IPs they wish. They do not have so many physical servers as they claim. Is Opera free VPN http://www.opera.com/computer/features/free-vpn considered as VPN scam? Opera’s “free VPN” is not a VPN at all. It’s a web proxy (that many people consider insecure), which shares data with third parties. See this explanation.